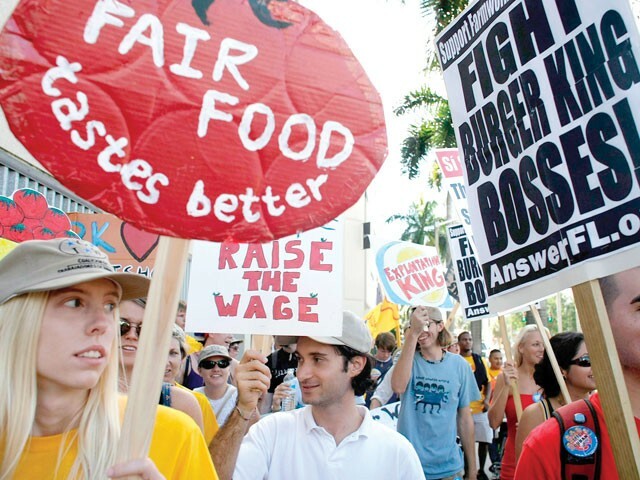 Protesters with the Coalition of Immokalee Workers march in Miami in 2007. If you eat tomatoes in America between the months of December and May, chances are some were picked in Florida, where labor bosses have been indicted in recent years for forcing immigrants to work as slaves. While slavery is one of the most egregious human rights violations in Immokalee, it’s hardly the only one. Thousands of workers are regularly cheated and sometimes beaten by their crew bosses in the area’s sprawling tomato fields. A typical day begins at 4 am, when workers assemble in a parking lot full of old school buses. Each bus is run by a different crew boss, who chooses the workers he deems likely to pick the most tomatoes. Many old or weak-looking hopefuls don’t get picked. A good worker earns about $50 for picking literally a ton of tomatoes. Much of his or her paycheck is then siphoned off by high rents for sub-par housing and extras — like $5 for a shower from a cold hose. An advocacy group, the Coalition of Immokalee Workers (CIW), was founded in 1993 to the chagrin of the tomato barons. “The tractor doesn’t tell the farmer how to run the farm,” said one. Despite the inhospitable climate, CIW has been quite successful, via a series of restaurant boycotts, in its campaign to persuade some of the larger purchasers of Immokalee tomatoes to pay a one-cent-per-pound raise to the pickers. A penny may not sound like much, but it’s the difference between $50 and $70 for that ton of tomatoes. To date, Yum! Brands restaurants, which include Taco Bell, Pizza Hut, Arby’s, Wendy’s and KFC, have agreed to the raise. So has McDonald’s, and last year Burger King did, too. Josh Viertel, president of Slow Food USA, joined a delegation to Immokalee at CIW’s invitation. At first glance, Slow Food and CIW seem like strange bedfellows. Slow Food arose, in part, as a reaction to the industrial-style agriculture system in place in Immokalee. The mission of Slow Food is to encourage food that is “good, clean, and fair.” Even if Immokalee’s tomato pickers were treated like kings, most Slow Foodists would consider the demise of industrial tomato farming a good thing. In an effort to engage directly with the workers, Viertel showed up at the parking lot at 4 am and spent time with the others clamoring for work. A farmer before he was president of Slow Food USA, Viertel understands that some of the most enlightening conversations are to be had in the fields, and he wanted to pick tomatoes with the regulars and talk to them.